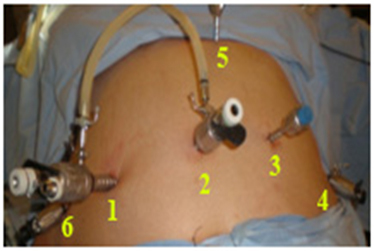 Laparoscopic bariatric surgery, the making of various types of anastomosis is often complex. We present a standard way of realizing the knots that shortens the operative time using continuous running suture and self-locking sliding knots. Our philosophy in complex laparoscopic bariatric surgery is to divide any hollow organs with staplers and make anastomosis always manually. We use six trocars (Figure 1), only one of them 12 mm in right para-rectal and each of the three surgeons involved to do one of three sutures manually. Hand suturing is a complex maneuver that must be performed carefully, with appropriate instruments and provides security in the preparation and/or reinforcement of anastomosis and space closure, using monofilament sutures to reduce the cost and time of intervention and a correct preparation of the threads facilitate implementation. The scrub nurse makes a simple running noose [1,2] sliding knot (Figure 2), which passes into the abdomen and by simply pulling the thread the knot is made. For many years we have been using the self-sliding knot in all type of sutures, in all type of tissues, both in open closures of fascias and in surgery of hollow organs, open and laparoscopic, without any incident or failure. The Aberdeen -De Cushieri knot , that we already present in the SECO-2004 Meeting Valladolid, ends all suture lines. They use running continuous sutures, either to reinforce staple lines or to perform complete anastomosis. This Videos shows how both type of knots are made in the following conditions: 1) Over-suture of duodenal stump in the Duodenal Switch (LDS); 2) Over-suture line staple-line in the Sleeve-forming gastrectomy (SFG), 3) Jejunum-jejunal anastomosis of the LDS; 4) duodenal-ileal anastomosis in the LDS and is also used to close the mesenteric defects. Protecting the SFG staple line to avoid bleeding and leakage is very important. Ferrer  cites our original work of 2005 [5,6] as we used a continuous monofilament suture to reduce the possibility of leakage and bleeding. We used to initiate the starting point with a double knot at the end of the thread, with two clips, that helped on the radiological control post-op. We were avoiding high intra-abdominal knotted in an awkward area. We start the division of the stomach at the pylorus level. We devascularize at least 1 cm distal on the duodenum, and this allows us to 1) Have a free duodenum and the use the first stapler on the pylorus; 2) Pulling pylorus with a clamp that goes from right upper quadrant and aligns all to the lesser curvature above the incisura angularis and 3) This clamp is re-applied progressively in the smaller curvature in a straight line up to the esophagus gastric junction (EGJ) avoiding twists and leaving a very narrow, but straight sleeve from pylorus to the UEG. Daes  was the first to describe in 2013, and should have the credit, the use of a preformed non-sliding knot suture and Albanopoulos  copied the idea but the preformed knot was a non-sliding. Baltar  and Ferrer  have published work on the continuous knotted suture. The work of our team [1,2] is the first to our knowledge that uses the sliding-knot that is easily tied and it seems very appropriate to Daes . We also use the greater omentum to cover the entire staple line with two purposes: 1) Cover a possible leak in the EGJ and 2) Avoid sleeve torsion anywhere on its route. 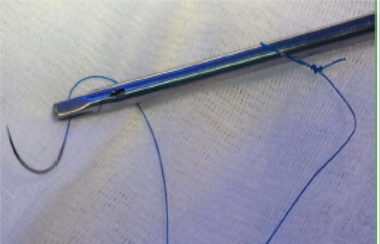 An interesting experimental study Rogula  of this year shows that the continuous running suture has greater resistance to sleeve punctures and leaks. Sroka  has also found that the continuous suture has a lower incidence of bleeding. Antrectomy has already shown in the work of Sánchez-Santos  that weight losses were higher. Obeidat  demonstrated in a prospective study of weight this year as the weight loss is greater when antrectomy is added. The Videos show the performance of the self-sliding knot to initiate continuous running sutures and the Aberdeen-De Cushieri knot to finish them. ©2016 Aniceto Baltasar. This is an open-access article distributed under the terms of the Creative Commons Attribution License, which permits unrestricted use, distribution, and reproduction in any medium, provided the original author and source are credited.